Not all scarfmakers included personal notes or contact information so you may never be able to know the stories behind your scarf. I wish the scarves could talk because each one has many stories to tell. Every scarfmaker would have a story about why they participated in the project, why they made your scarf, and the people they met along the way. They may also have shared the scarf with their friends or church who may have blessed it or oohed and ahhed over it (a knitters’ blessing!). 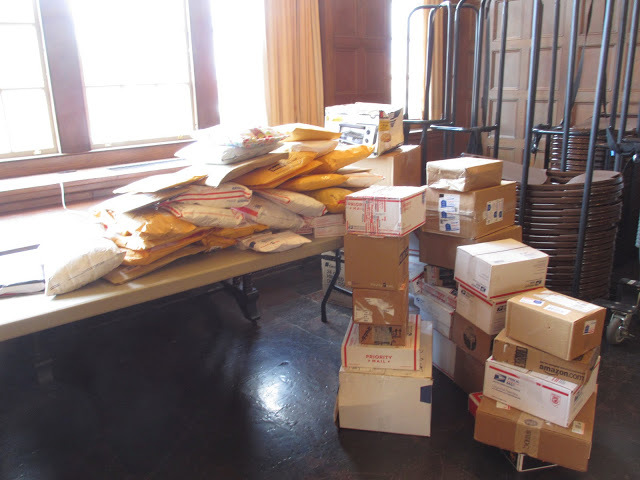 The scarves were then handled by hundreds of USPS/UPS/FedEx workers or delivered in person by individuals and groups. One woman drove from the Albany area to hand-deliver her scarf at our April 5th Knit In event! Upon arrival at Old South, packages and bags were opened, notes were read aloud, scarves were tagged, refolded, and placed in bins. Your scarf may have become a favorite among volunteers. Some scarves were repaired by tireless volunteers dubbed “the doctors”. There are some scarves and scarfmakers we are still talking about because of the personal notes they wrote to the project organizers and volunteers or because of the amount of work we know was involved. We marveled at the variety and creativity. Every scarf is a work of art. Some scarves were made by young children and first time knitters & crocheters. Not only were scarves made by Christians, they were also made by Muslims, Jews, and atheists. Some scarves were made in honor of survivors. Some scarfmakers are like hares, while others are like tortoises – your scarf may have been made in one hour or perhaps 26. 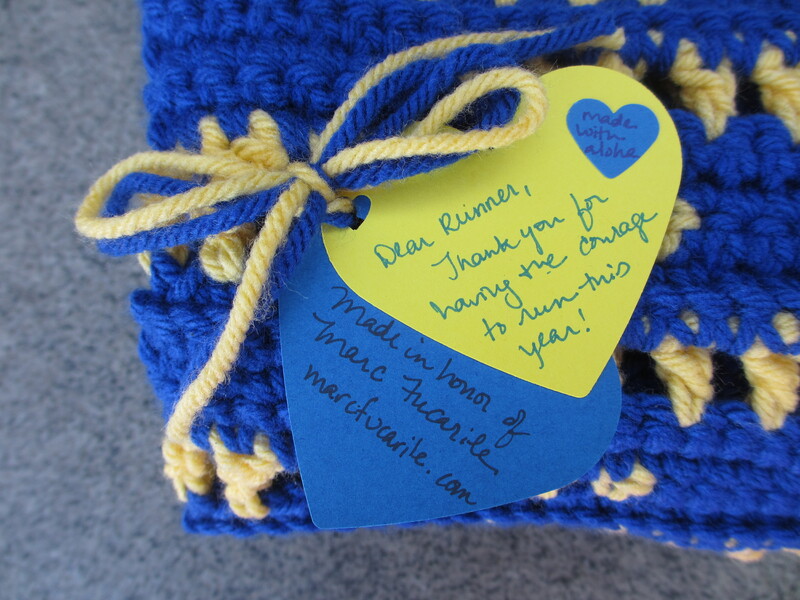 As the official Marathon Scarf Project tag says, each and every scarf was “interwoven with love and courage”. They were all made with love and given with love – a gift to you from someone’s heart. Although we know that around 7,400 scarves were processed, no one is sure of the exact total of “marathon scarves” out there because many were given directly to loved ones. Many scarfmakers apologized for not making more and said they would have had they had more time. Many had only heard about the project recently and rushed out to buy materials and get some scarves to Boston. Some packages were from repeat scarfmakers who said they couldn’t stop so they had to make just one (or two or five) more. Thousands of scarves were the result of community projects. 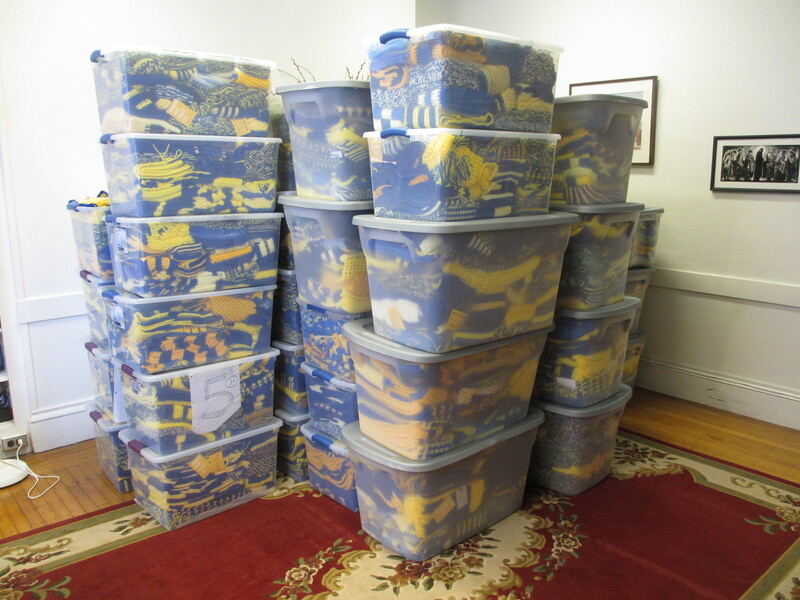 It’s true that the final number was not enough to provide scarves to all 32,408 runners of the 2014 Boston Marathon, however we scarfmakers made as many as we could in the 2 months or less that we had from the time the project was hatched or when we heard about it. The project spread mainly via word of mouth through church networks, social media, senior centers, yarn stores, and knitting groups. I heard that the founders had not set out with any expectation of receiving thousands of scarves, but this project resonated with so many crafters – knitters, crocheters, weavers, and sewers – that the scarves poured in. These scarves brought people together, sometimes in unexpected ways. Scarfmakers connected with one another online. Friendships were forged. After people’s scarves were “out in the wild” we had great fun spotting our scarves on the news and social media. We cry when we see the people who received our scarves and when we’re fortunate enough to be able to connect with you. 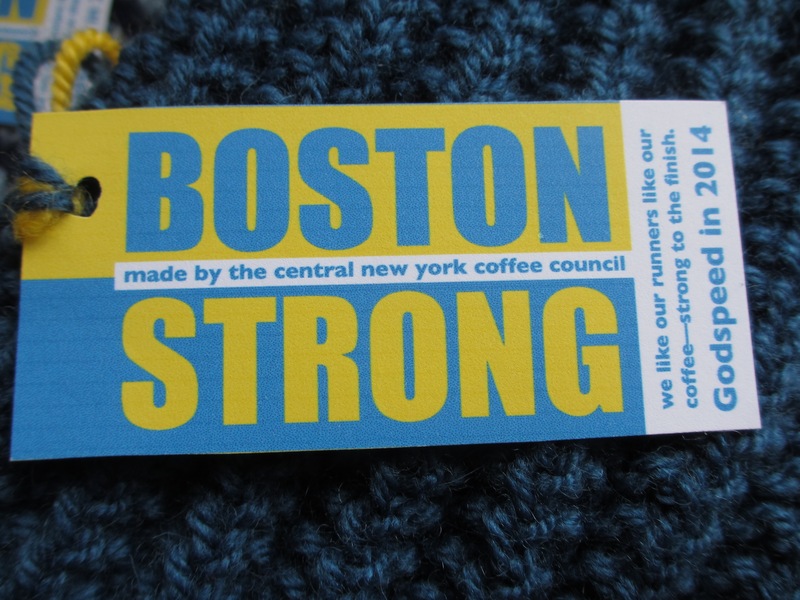 I personally chased down a man from Pennsylvania on Boylston Street after recognizing the scarf he was wearing from Ravelry, a social network for knitters, crocheters, spinners and weavers. I wanted to take his picture for his scarfmaker although in my excitement, I forgot to ask for his contact information. I am not affiliated with Old South Church other than as a scarfmaker and volunteer and couldn’t ask permission of the thousands of scarfmakers and volunteers to write this, but since some of you may never meet your scarfmakers, I wanted to share some of your scarves’ stories so that you can know just how meaningful this project was to those of us who contributed. There are thousands more stories to be told. I hope that you’ll be able to connect directly with your scarfmaker and learn more about your scarf’s special history! They would love to hear from you. Thank you for coming to Boston and congratulations! 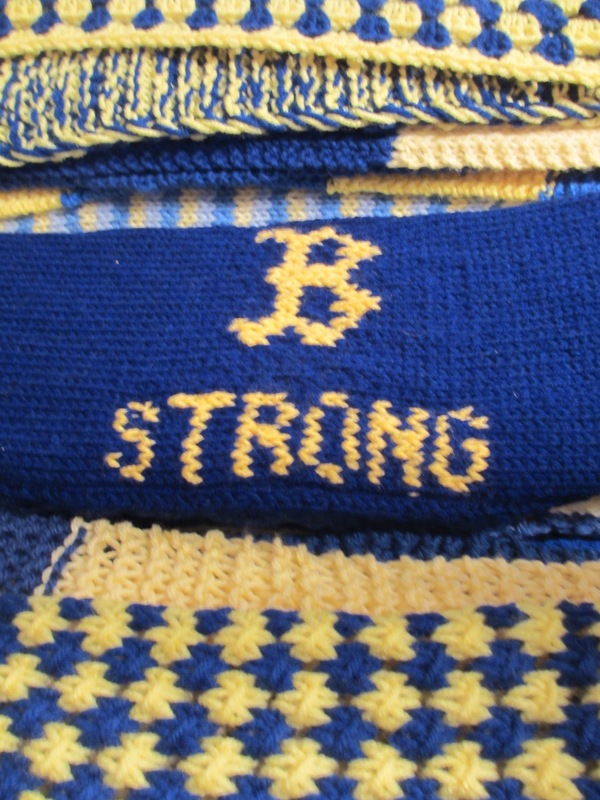 For more wonderful scarf stories see Thank You from the Boston Marathon Runners on the the Raging Wool Yarn Shop’s blog and Old South Church’s Facebook page. This post is dedicated to storyteller Kevin M. Brooks, who was taken from this Earth far too soon. Here is some coverage from local news outlets that tells the stories of some of the thousands of scarfmakers out there. If you’ve seen another article that profiles a scarfmaker or group of scarfmakers, please leave a comment! Grafton, Massachusetts – The Grafton News: Scroll down for an adorable photo of Girl Scouts wearing fleece scarves they made. Mary Thomas from Hollis, NH was also interviewed by NPR: A Year After Boston Marathon Bombing, How Does Public Grief Help? What a wonderful and touching wrap-up! Thank you for all you did and for putting this together and sharing what made this project successful, fun, memorable and healing. 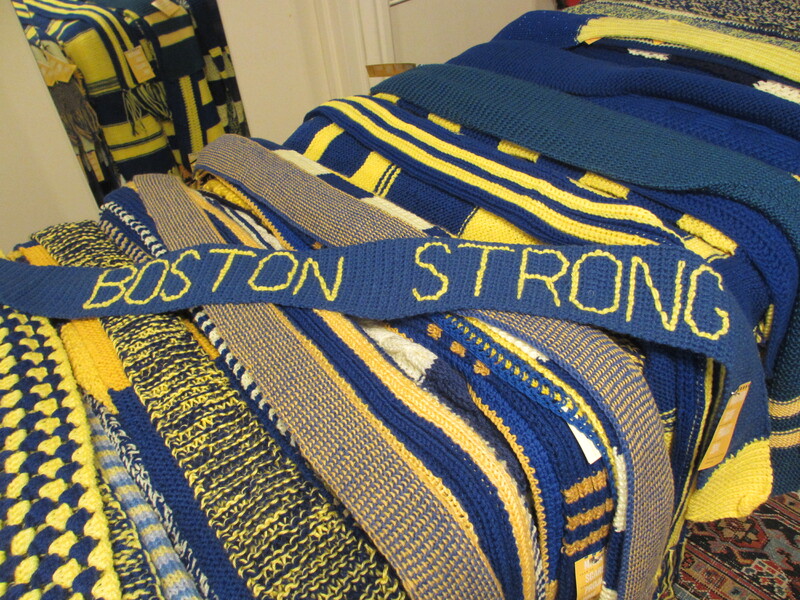 This is the story of how the Boston Marathon scarves came to be. The capacity for people to care and give of themselves never ceases to overwhelm me with humility and gratitude. This is really wonderful!! This was a highlight for me. So touching! Thank you for writing this. This is entirely fitting. I am part of a community of runners that were brought together by the Boston Marathon. We connected online and lasting friendships have formed. Thank you and thanks to my scarfmaker, Therese from S. Yarmouth, MA. Someone commented to me yesterday that she thought it was so interesting that this project brought together fiber artists and runners. There’s some overlap between the two groups but we’re often a sedentary bunch. 🙂 It’s been great seeing the connections that people are making with folks they might not otherwise have met! My husband ran his first Boston Marathon in 2013 (he finished fast & we were thankfully gone before the tragedy struck), and we returned last month for him to run it again. We live in Georgia, and we visit Boston as often as we can; there is just something about the people and the city. But this Marathon Weekend was hard to even describe. The friends we spent time with are forever forged in our hearts. I can’t imagine another weekend ever comparing. It’s like we could feel the actual city reaching out to us. When my husband first learned of the Scarf Project (when we were at the race expo), he all but ran down Boylston to ensure they didn’t run out before he got one. He spoke with a few volunteers, and spent time admiring all the scarves. When he finally settled on one, he wore it almost constantly for the next few days (even on a shake-out run with Bart Yasso!). The kindness that went into this project, and all the love that was felt by the recipients (and their spouses!) are so very much appreciated. Two of my friends who ran Boston this year got scarves, and they both love them! Thank you! Thanks for the reblog! I’m so glad your friends like their scarves! I so wanted to receive one of these as a runner who was there last year and ran again this year….but was not lucky enough to get one. My heart was warmed by seeing them around others necks, however. Thank you to everyone who took the time to create these wonderful keepsakes!! Thank you for your gracious thanks! 🙂 It’s been gratifying to hear that people were moved just seeing the scarves on others. I was a runner at the 2013 marathon who was on Boylston street when the horrific events unfolded. Although unable to finish the race last year, I was gratefully granted a second to return and cross the finish line this past April. 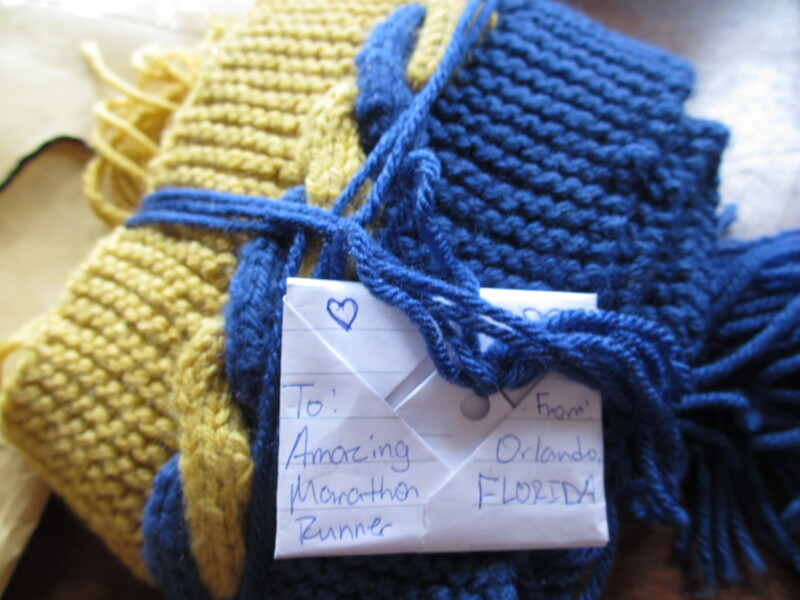 When my grandmother learned of this project just a few weeks before the marathon she quickly knitted a few scarves and sent them to the church. While in Boston for the marathon I tried several times to come by the church to receive a scarf of my own but the timing was never right. On Easter Sunday, we stood in line for the 9:00am service only to be turned away right at the door because the church had reached capacity. Not only was I disappointed not to be able to attend Easter service but I had I thought I had missed my last chance to receive one of these beautiful scarves. It was then my husband pulled a package from his bag and presented me with a scarf that my grandmother had knitted especially for me with my name and date in the pattern. It brought me to tears and is something I will treasure for years to come. Thank you for this project that helped bring people from around the world together in peace and solidarity. Seeing the city of Boston decorated with runners proudly wearing their blue and yellow scarves that weekend is something I will never forget. I hope the scarves that my grandmother knitted have found a good home. Hi Ginger, Thank you for sharing your wonderful story! I have heard that many runners were gifted scarves directly by fiber artists they know, although all the stories I’ve heard happened before arriving in Boston. What a fantastic surprise your grandmother and husband planned for you! If you haven’t already posted this I’m sure that Old South would love to hear your story and see your scarf. You could post it on their Facebook wall. 🙂 And thanks to your grandmother for the scarves she sent in! It was so special for me to volunteer and see the thousands of scarves that people poured their time and love into. I love hearing the stories of how scarfmakers got involved with the project. I am sure that your grandmother’s scarves are cherished by their recipients. I’ve seen a lot of comments from runners that their scarves are more precious to them than their finisher medals. Every time I read a comment like that it brings tears to my eyes. I’m so glad you could return this year and bring positive memories of Boston home with you! A fellow scarf maker’s thoughts on the greatest experience of our cresting lives.